The dressing is incredibly light and very refreshing with the hint of lemon, the grapes compliment it perfectly and the addition of sunflower seeds makes the dish even healthier! Quick health tip? Here are some great and easy ways to include sunflower seeds in your meals…sprinkle them on salads, mix in with scrambled eggs and include them in your chicken or tuna salad! These seeds have an excellent source of vitamin E as well as many essential minerals like calcium, iron, magnesium and selenium. Oh! One more way to enjoy them? Add them to your broccoli, cauliflower and carrot salad 🙂 Check out the recipe below and enjoy! 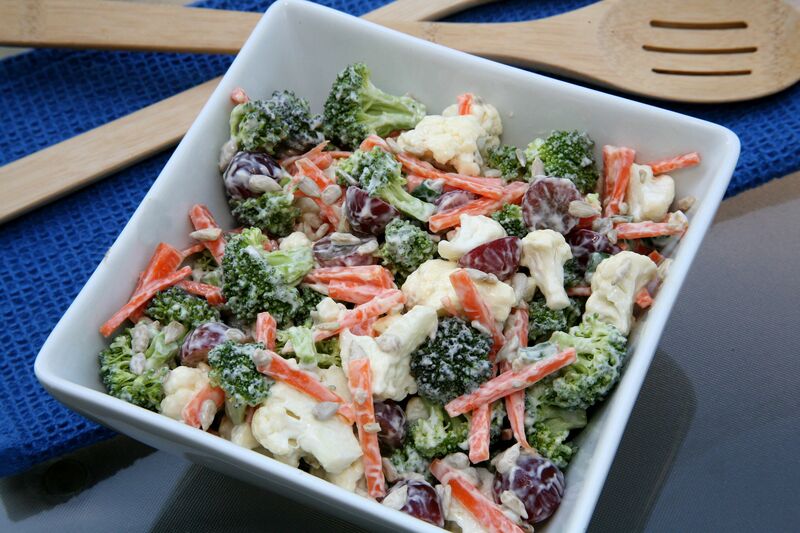 Rinse and cut broccoli, cauliflower, carrots and scallion and add to a large mixing bowl. Slice grapes and add to the vegetables. Pour sunflower seeds into the mixing bowl of vegetables and grapes. In a small mixing bowl, add all dressing ingredients and mix until well combined. Gradually add the dressing to the salad and toss to coat. *Important to add gradually to ensure you coat to preference! I only used about half of the dressing made!